A biography of Grand Admiral Karl Donitz, commander of the U-boat arm which threatened Britain's trans-Atlantic shipping lanes in World War 2, who was chosen by Hitler as his successor in the final days of the war. The first book to strip away the myth fostered by Donitz himself and his U-boat veterans that he was an a-political naval officer. 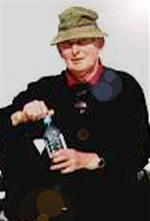 "Peter Padfield's theme is greatly and in places brilliantly elaborated...in essence his is a story of national disparities ferociously resented by the weaker party and played out over 40 years through the medium of intense and cruel competition at sea... His compellingly readable book conveys a flavour of Nazi leadership unmatched by anything outside the memoirs of Albert Speer. It is difficult to frame higher praise." "Peter Padfield, sea-officer turned naval historian has dropped a pattern of depth charges plumb on top of the legendary image of Dönitz, Commander-in-Chief of the German Navy, Grand Admiral and Hitler's appointed heir to the last-ditch leadership of the Third Reich." "This biography and analysis of the life and mind of an exceptionally capable naval officer and leader distorted by the evil of Nazism, is a major work of scholarship by a writer whose thinking is not locked into the rigid limits of establishment or service loyalty." 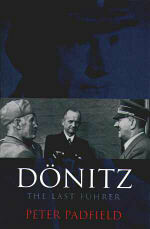 "Peter Padfield, the distinguished naval historian, has researched his subject diligently and has written about Dönitz with his usual verve. It is a good book to read; the style does not tire, the story keeps going, the research is quite considerable but sits lightly. It is also a very critical book, stripping the whitewash off the officer and gentleman that Dönitz claimed to be at Nuremberg..."
"...well-written biography...we are shown Dönitz's genius as well as his shortcomings..."